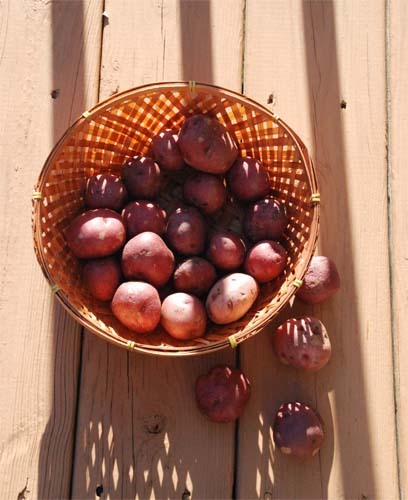 hmnnn that looks so yum, might give it a go tonight since I have these baby potatoes that need to be cooked up soon. 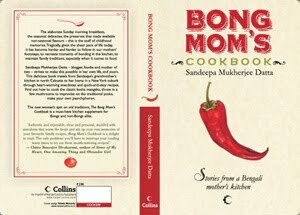 Thanks for all ur lovely recipes, I love bong food. Grew up in Kolkata so that's where my love comes from. I learnt a few recipes from my maid, miss her yummy food so much. Really love reading your blog too! 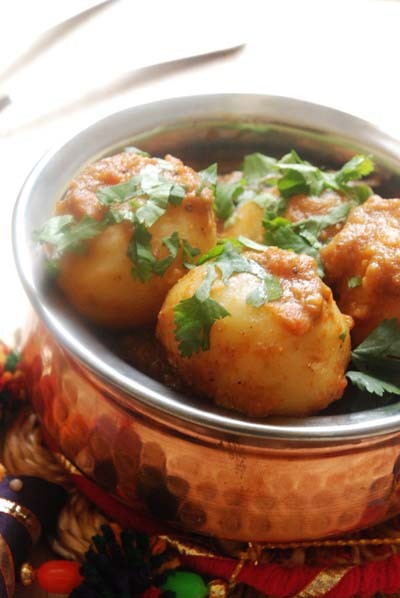 beautiful alur dom recipe. the bhaja masala is very unique but is very aromatic i guess. Nice photos. Yummy dish, dear. I will make. Take care. It IS me - this is a niramish comment. Thanks dear. U luv niramish. Thanks.I made this dish today niramish for Ashok Sasthi.Its Tasty. My mom makes one with ginger garlic paste ..delicious...till date failed to reproduce the same taste even with her standing beside me!!! Hather cho(n)wa , i guess! Eita thik bolecho, same taste amar haath eo ashe na. Hey, you forgot the third kind of vegetarian food bongs love- the one that includes fish :) love the pic with the colourful thingy. Curry looks GOOD! Yummy, and definitely a true Bong soul food....Hope you had a great colourful Holi with family. No Holi. Just a single dot of abir. Just wanted to let you know - it's "coriander", not "corriander" as you keep spelling in your all recipes involving this spice! Really??? Did you just do a spell check or actually try out this recipe?? I think we spellled it "corriander' in India, something to do with British English. i will get back to you with more correct information regarding this. Hmm..colour becomes color ..flavour becomes flavor ..and so on..British English is diff than US English.. True, but coriander is still coriander (not corriander) in all forms of English! BTW, it has nothing to do with Indian/British/American English- this is just a spelling mistake. I've lived in India my entire life and it has always been c-o-r-i-a-n-d-e-r. Sorry, didn't mean to nitpick or be critical! Thanks Sami, guess you are right (if not proven otherwise) :-D. Please do keep a lookout for other such mistakes on my blog too and let me know. It is critical to be "Critical". Quiet delicious but need to make the bhaja masala first I guess. Love your pictures and Happy Holi! That certainly looks delicious. 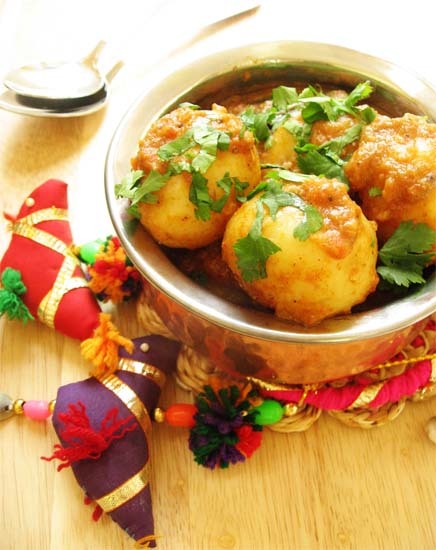 I am all for simple and tasty aloo dum. The other dum recipe takes too much time. moms' recipes are the best! :) i've been sent a whole bunch of them recently and i am going crazy trying them all. I love it how your Mom sends the recipes along with the gorgeous pics. this alur dom would have been perfect with some luchis this morning...btw wasn't aware of any vegetables apart from potatoes...aren't they synonymous? Yogurt is very little to make the paste. My mother use yogurt to make the spice paste instead of water. LOL to passion to run away. I feel blessed that the bongs have so many delicious recipes without onion. Simple homey and comfort.Will soon link to yours and will try with the methi and bhaja moshla next time. 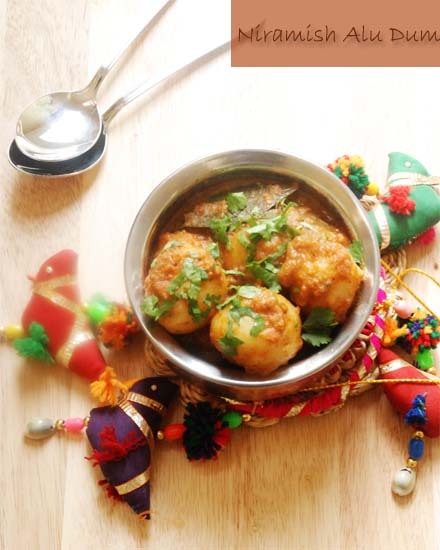 Bong Mom - I recently tasted this Niramish Dum Aloo at a Bong thela served with two Parathas. The Potatoes were soft cooked, had a tangy finish and were garnished with chopped onions, coriander. I now realise yoghurt adding to the tang which was a great compliment to the Alu. Thanks for sharing this. I will surely be making it soon. Yes,yes,yes,niramish all the way1 I'm SO not comfortable with onion-garlic1 Don't know why. Just don't like them. I make everything niramish-vegetables,chicken,fish...almost everything! So here's a question, what if I made it with mustard oil? Does it become less vegetarian because mustard oil also invokes passion? And, here's another, what is White Oil? Arre kya re white oil nahi pata ? Safed tel. Okay honestly I don't know. But all non-mustard, non-olive, non-sesame oil is white for me. I switched to peanut btw. You might be right on mustard oil and passion track but go ahead and make it. Ideally it needs shuddh ghee. 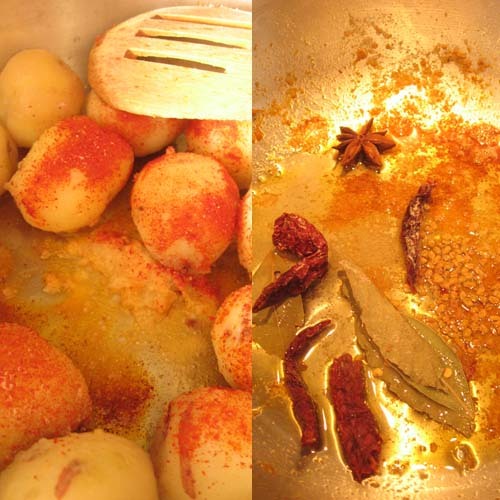 Whoa, 4 types of chilies in different forms, plus the peppercorns in the bhaja masala! Looks lovely. 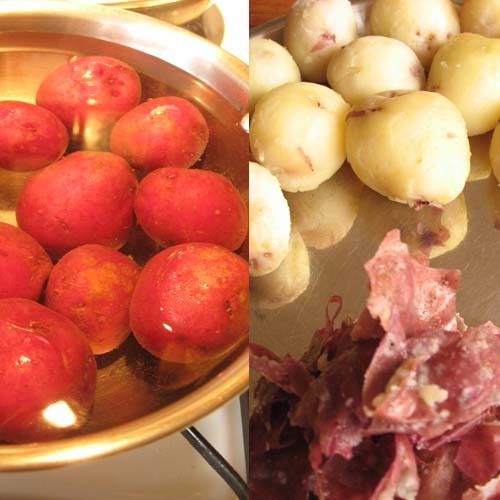 this recipe is a keeper - made it on sunday night - the best alu dum I've had [ or made!] Also have a bottle of bhaja masala now thanks to your earlier post! Thanks Nina. I am glad I learned it too. The bhaja masla addition is unique - must try this recipe out next time . Chhoto alu ekhono paoa jachhey ! bhaang er nesha katate gele ektu carbs naa holey ki hoy.. jaai hok, eita holir porer din baashi kheteo khub bhalo lage .. my 2 cents. The tougher it is to cook, the tastier it gets. This was wonderful. My mom was visiting us and she usually has niramish on Tuesdays. I am too bad at cooking niramish and so as always Google it. Your post was the first. Made the recipe, also made the bhaja masala and have stored some too for later:-) and it was yummy. Thanks for sharing!